For a country not even the size of California, Vietnam has pretty much everything you could ask for: lush green paddy fields, tropical jungle, white sandy beaches – it has it all. A relatively narrow strip of mountainous land falls down into the South China Sea, just north of the equator giving this small piece of planet earth a huge range of geological gold stars. 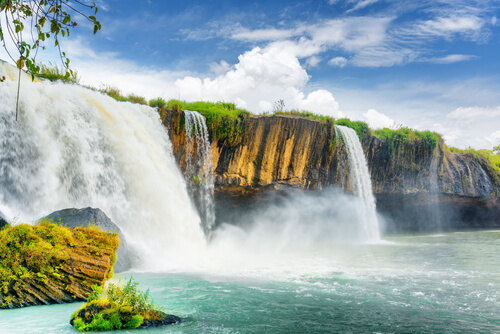 Much of Vietnam is made up of lush mountainous regions, where thunderous waterfalls crash through tropical jungle. The Central Highlands, bordering Laos and Cambodia is populated by minority farming people who live in ‘longhouses’ in the misty mountains. Working on coffee, rubber or tea plantations, the Jarai or Bahnar minorities – dressed in woolly jumpers and bobble hats – are more likely to see elephants, gibbons and bears wandering through the jungle mountain than a lonely backpacker. During colonial times, the French would escape the stifling heat by creating hill stations as they went. Da Lat near Lak Lake in the Central Highlands is a far flung but picturesque resort, whereas Sapa in the north west is somewhat more accessible and arguably offers the most impressive views of anywhere in Vietnam. The dramatic scenery around Sapa is what postcards were designed for: sunlight reflecting on the lush rice terraces, create creating magical vistas whatever time of the year or time of the day. 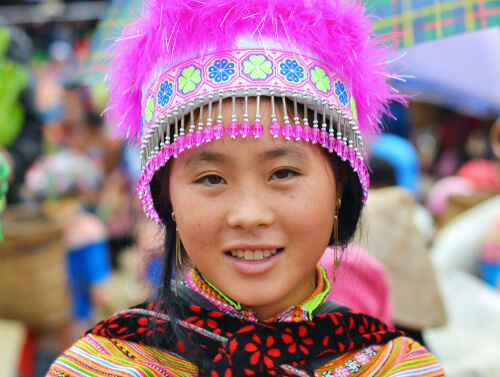 Minority people populate this region, including the Hmong, who wear bright colourful clothing with extravagant headdresses, and their neighbours the Dao people recognised for their red headwear on top of dark blue gowns. With babies strapped to their backs, they have spent centuries tilling the land using the same techniques passed on from one generation to the next. And not all mountains are inland. The jagged karst mountains that crash out from the still waters of Halong Bay made a backdrop you’ll never forget in the nearby Gulf of Tonkin. 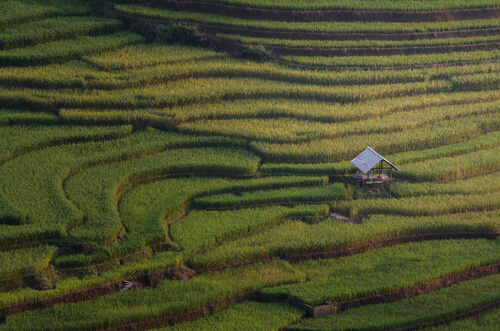 One defining feature that can be found throughout the country is rice fields. It wasn’t long ago that rice was Vietnam’s top export along with fish – today its electronics and shoes. But rice is still a staple in Vietnam. The noodles are made from it, even the bread is made from it. Rice fields, which nowadays can be utilised three times a year or more are incredibly hard manual work to plant and harvest but they keep large swathes of land untouched by the modern industrial world. In the northern hill regions, reflective terraces snake around steep mountains. In the plains of the Perfume River, fields of rice turn into a never ending ocean when the sun sets reflecting on the wet fields glistening off into the distance. And the water buffalo, knee deep in mud, that can be seen helping plough the flat lowlands of the Mekong delta create a picturesque view of a time gone by. Lots of rain and lots of heat create a lot of biodiversity. Much of this was destroyed during the American ‘scorched earth policy’ in the 1970s of fire bombing and dropping 20 million gallons of agent Orange and other herbicides on the forests, to destroy the jungle canopy and reveal the location of the enemy. The damage was vast, not just to the land but to the people on it. Half a century on, and the jungles and forests are starting to return with many indigenous flora and fauna returning to the areas. In such climates, it is hard to keep the jungle at bay. The green slime and tough weeds that climbing up the walls of many old building trying are evidence of the jungle trying to fight back. There are plenty of places to explore the forests and jungles with many areas having been turned into national parks. Cuc Phuong is one of our favourites and only a day trip out of Hanoi. Visitors to Vietnam are increasingly drawn to the three thousand kilometres of coastline that the country is lucky to have. Scuba diving is increasingly popular in the beach towns such as Hoi An. Nha Trang has become a wind and kite surfing centre, while people are surfing up and down the coast from Da Nang to Vung Tau. But if it’s beautiful beaches you’re after then you won’t have a hard time finding one here. 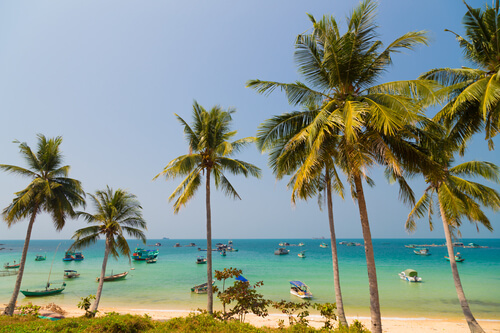 Phu Quoc, an island at the very southern tip of the country has some excellent white sandy beaches with clear water. It’s a tropical paradise with coconut palms swaying in the breeze but getting there isn’t always that easy. Luckily there are a number of world-class beaches right in the centre of town. Hoi An – once a sleepy little fishing village is still one of our favourite towns, not just for its excellent food and very affordable tailors market but because it has a clean white beach just a few minutes scooter ride from town. Cua Dai beach has enough cafes and bars to keep you in cocktails and sweet, sweet coffee but is quiet enough for you to enjoy the views of the sunset over the nearby Cham Islands. 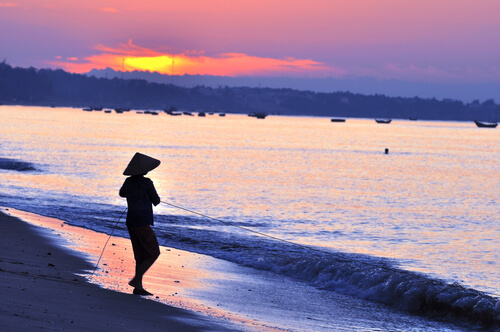 Nha Trang has grown into a lively town and it has an abundance of coastline. The beaches are fantastic but people come for the great food, the nightlife and the party boats. For something a bit more tranquil, Doc Let beach, on the Hon Khoi peninsula just north of Nha Trang offers some peace and seclusion. A great way to spend a day beach bumming.